Definitely, the International Training Session for Young People for Development in 2008 will be in Melbourne, Australia on July 5-10, 2007. The YPD General Assembly will be held in Sydney, Australia.It takes up the challenge of Green World Youth Day and will talk largely on Water. The Green World Youth Day program was launched by no less than the CEO of the City West Water in the person of Ms Anne Barker. 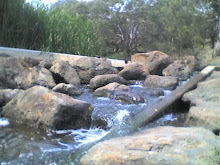 Ms Barker spoke about the water shortage that Australia faces and how the people and the City West Water tries hard to overcome the situation. Testimonies and welcome speeches filled the night as the participants caught a glimpse on how the week's program would be. The launch was held at Victoria University, Flinder's Campus on July 5, 2008. YPD Japan on the move! Although there are a few members of YPD Japan, we are motivated enough to work together! we bought handicrafts directly from villages of Thailand, some are made by YPD Chiangmai Team. We sold them in Japan to support YPD Chiangmai and YPD Karen. Jean-Joseph(YPD France) living in Japan came help YPD Japan. Everytime we do something, we meet young people to help us. This is the YPD work! Vince, Kins and Charles went to the Victoria Parliament Building to dialogue with the Western Members of the Parliament as a way of profiling the Green World Youth Day program. Water for Life as the theme of the program was received with much enthusiasm by the MPs and encouraged the holding of this international program at the Western Region. The said meeting was facilitated by Mr. Thelmo Languillier, MP for Derrimut District. Mr. Languillier was once a student leader in his time at the Victoria University. We did not draw millions of crowds, there were no screaming fans nor hyped up paparazzis. It was a tame concert to the standards of many. 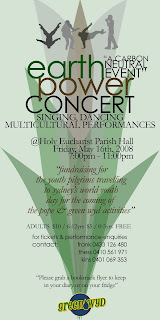 It was a parish concert attended by the locals and the performers were from all over Melbourne. CALLING ALL INTERESTED AND COOL PEOPLE IN MELBOURNE! THIS IS OUR LAST CALL TO REMIND YOU OF OUR CONCERT TONIGHT. DOORS OPEN AT 7 PM AND TICKETS ARE AVAILABLE AT THE GATE AT $10. SHARE YOUR FRIDAY NIGHT FUN WITH THE GREEN WORLD YOUTH DAY ORGANISERS BY SUPPORTING THEIR FUNDRAISER. THE EVENT IS CARBON NEUTRALISED BY AN ANGEL. Feel free to share with us your views and opinions!